BuildBlock is a firm based in Oklahoma. However, they offer the highest quality and most technically sound and thorough website and customer service in the industry. You can choose to work with Master Distributors who live inside the American Redoubt as your way of supporting a fellow Redoubter. If you’re a builder how about starting a Ballistic Home Construction Firm in the American Redoubt using ICF? ICF is perfect for that secure storage or basement under your new Yurt! What’s the difference between insulating concrete forms and insulated concrete forms? Insulated and insulating concrete forms are the same. We generally use insulating because the insulation is continuous and ongoing throughout the life of the home. Why Choose Insulating Concrete Forms (ICFs)? What are the advantages of an Insulating Concrete Form (ICF) home or building? Insulated Concrete form structures are much more comfortable, quiet, and energy-efficient than those built with traditional construction methods. Use the menu on the right for more details about the advantages of insulated concrete form homes and buildings. Traditional wood-frame construction can’t compare to the safety, permanence, and energy efficiency of walls built with insulating concrete forms. An ICF Safe Room provides protection from winds as high as 250 mph and can be engineered to stop almost any small arms projectile. These safe rooms are created by building any room (such as the master bedroom closet) with ICF walls, pouring a concrete “lid” on top, and installing a steel door. Not only does it keep your family safe, a closet Safe Room is a fire-resistant storage area for your valuables and heirlooms. Integrating a safe room in to your new home design, adding to an existing home, or retrofitting current home are all affordable and straightforward. Looking for a home plans with a safe room or a safe home? Safe Room can be used as another room in your home. Make your safe room a closet, bathroom, bedroom, office, or pantry. The safe room can even encompass the entire basement if needed. 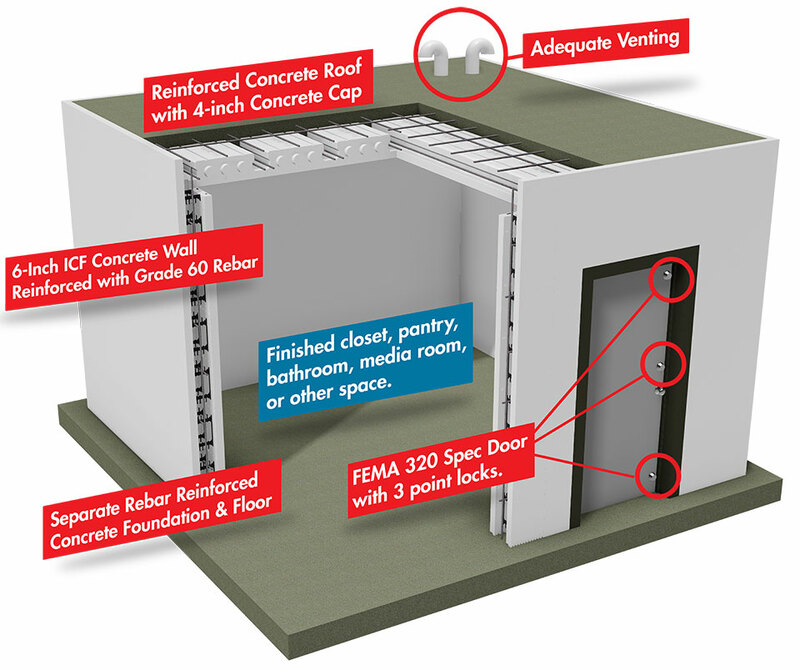 ICF Safe Rooms are like any other room in your home. Master bathroom, bedroom, closet, pantry, media room and more. Building a safe room doesn’t mean building an ugly bunker. Using ICFs, you can finish this room however you would like and use it as a part of your home each day. Depending on the size and scope of your individual project, you can almost break even in costs and enjoy your Safe Room each and every day as a new addition to your home and a safe haven in inclement weather. Pictured above: Construction in progress of a Safe Room/Master Bedroom Closet being added on to an existing home. Upgrade an room such as an interior bathroom, bedroom, pantry, closet, or office. Do they stop fire from spreading? 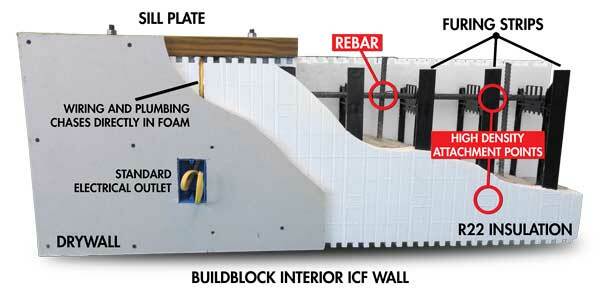 The fire wall test confirms this rule for ICFs once again. Part of the test measured how well the wall slows the passage of heat and fire from the side with the flame to the other side. The ICF walls tested did not allow flames to pass directly through. They also did not allow enough heat through to start a fire on the cool side for 2-4 hours. In contrast, wood frame walls typically allow both flame and fire-starting heat through in an hour of less.